Blake Griffin scored 18 points in the second half, including the final seven in overtime, as the Pistons beat Orlando. HAD TO HAVE IT – That’s the kind of game the Pistons can’t afford to lose. They came dangerously close to doing so. 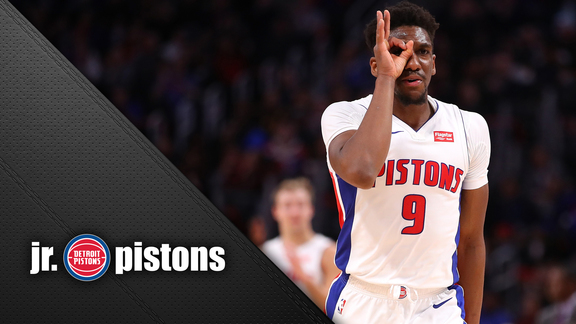 A half-game behind Orlando and 1½ games out of the final playoff spot in the East coming into the game, the Pistons led by eight points with five minutes to go, needed an Andre Drummond put-back with 33 seconds left to tie and then missed a chance to win in regulation when Blake Griffin missed a 20-footer at the buzzer. He atoned for that miss, scoring 18 second-half points including the last seven in overtime after Orlando had taken a 115-113 lead. The Pistons scored the first four points of overtime, but then two Terrence Ross triples on consecutive possessions put them behind by two. A Griffin basket and two Griffin free throws put them ahead by four points as they strung together four straight defensive stops, then they made it five straight and gave themselves breathing room as Griffin bulled his way to the rim for a layup with 14 seconds left. Griffin led the Pistons with 30 points. After giving up 30 first-half points in the paint while Orlando shot 67.5 percent, the Pistons did a much better job limiting Magic penetration in the third quarter. They took their first lead on an Ish Smith 3-pointer with less than five minutes left in the quarter. Andre Drummond was one of six Pistons in double figures and dominated the glass with 22 rebounds. (NEARLY) FULL HEALTH – One game after Ish Smith’s return, Zaza Pachulia’s return left the Pistons as close as they’ve been to full health basically all season. Henry Ellenson is now the only player left on the injury report, still out with a sprained ankle suffered last month. Khyri Thomas, coming off two impressive cameos, was a late scratch with lower-back soreness after taking a hard fall in the closing seconds of Monday’s loss at Utah. With Pachulia and Smith back, the second unit’s offense functioned at a much higher level. In fact, it produced 20 points in the first seven minutes of the second quarter. Pachulia picked up three assists in the first half and would’ve had four but for a point-blank missed layup by Luke Kennard. Dwane Casey altered his rotation pattern in the second half, bringing Pachulia on just five minutes into the third quarter to play with the starters. He finished with six points and three assists and was plus-16 in his 15 minutes. Smith’s timing in his hesitation drives and mid-range surges to create space still was clearly off. He finished with six points and two assists but was just 1 of 7. BOLSTERED BACKCOURT – How to interpret the signings of Isaiah Whitehead and Kalin Lucas to two-way contracts? Hard to see it as anything but a reflection on the state of the point guard position with the Pistons. Both Whitehead and Lucas not only are point guards, they’re point guards with previous NBA experience. Whitehead, the 42nd pick in the 2016 draft, played 89 games over the past two seasons with the Nets, who got him in a draft-night deal with Utah after he averaged 18.2 points in his sophomore season at Seton Hall. At 6-foot-4, he’s athletic and physical and more scorer than playmaker. At 23, there’s plenty of growth potential with Whitehead. Lucas, 29, played at Orchard Lake St. Mary’s before spending four years at Michigan State, the last in 2010-11. His NBA experience consists of one game with Memphis in 2014-15, but he’s been in several training camps and Summer Leagues and has vast experience in the NBA Developmental (now G) League and overseas. The Pistons got Ish Smith back on Monday night after a 19-game injury absence, so they’re fully stocked on the 15-man roster with Smith, Reggie Jackson and Jose Calderon. Signing two more point guards to two-way deals gives them flexibility to make other moves within that position group. The NBA trade deadline is Feb. 7. In order to sign Whitehead and Lucas – who can spend up to 45 days each with the Pistons between now and the end of the G League season in late March, then spend every day after that on an NBA roster – the Pistons waived both Keenan Evans and Zach Lofton.